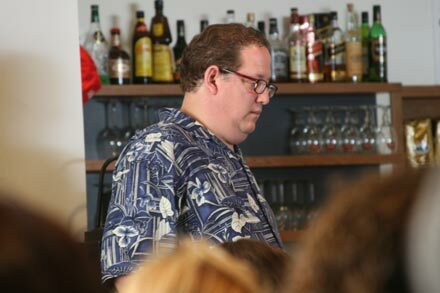 I like Jeff Pulver. He was the keynote speaker at Amuta 2.0 – an event aimed put on by Illuminea aimed at letting non-profits make use of social networking tools like facebook and twitter and blogs. Pulver, a pioneer in the voice over IP industry, said all the usual things – brand yourself! Be passionate! Nurture community! OK. Great. You uh… learn something new every day. Pulver also talked about his childhood – spent on his HAM radio rig. Apparently he spent a lot of time on that because when he went to his high school reunion, lots of people had no idea who he was. He seems to have glommed onto the Internet effortlessly thanks to his previous HAM radio experience. Except now, people know who he is. He has reached the 5000 friend plateau on facebook, 6,521 followers on twitter – and largely on the strength of his name brand recognition, filled up this event beyond the room’s capacity – at 100 NIS a head! Well done. But yeah… I’m here more to be supportive than to learn anything – though I am willing to be surprised. Now I am listening to Caryn Green of CrossRoads (they work with teenagers at risk in Jerusalem) who will be followed by award winning blogger and cartoonist, Dry Bones’, Yaakov Kirschen, Aharon Horwitz, co-founder of Presentense and Alan Abbey, Website director of the Shalom Hartman Institute. There are a number of familiar faces and everyone here seems to be so very, very earnest. I think the thing that doesn’t get said a lot at these events is that while there are endless tools that can be used to help you connect and communicate with others, one needs to make a serious cost benefit analysis vis-a-vis how one uses one’s time. I find that in my experience, the more we write, the more we are read. Networking events are nice and all, but does our audience really care? I look forward to hearing your thoughts on my presentation. Great to meet you. I’m a big fan and regular reader. As for a networking event, it was worth it for me to speak in order to to spread the word about Hartman Institute, to get folks like you to mention me and our website, and to receive some extra publicity. I look forward to seeing where else this gets mentioned. Someone or two had webcams going…Where were they? Hi David – thanks for coming to be supportive. That was very nice of you. As for whether our audience cares about networking events – it doesn’t matter. We can’t network too much or else we’ll never get work done, but it is important to get out from behind our computers sometimes and meet people in the real world. Some really good stuff can come from that. Miriam: You all put together a great event. It was well run, on time and attracted a very good portion of the Jerusalem (and beyond) anglo/non profit community. I think between this event, and the one put on by NBN, we’re all ready for some hands on training – something practical and in depth. But this was still nice anyway – and practical too as I think I just made a deal for some stuff… stay tuned! Alan: Your presentation was very good – a great demonstration of what it takes to increase one’s visibility and the resources and mindset needed to do so. I’m a big fan of Shalom Hartman because I know for a fact that he’s a Montreal Canadians fan despite being originally from Brooklyn. Do feel free to reach out to us if ever you need more exposure or something. Thanks to Amuta2.0 and all the sponsors. Click link below to see a Wordle as a small thank you! CK – my gut says that you’re right about “the more we write, the more we are read”. But I find that attending a networking face-to-face once in a while augments my writing – I have more ideas of what to write about, I meet people in person that I want to write about, and they meet me (and hopefully want to write about that too!). Anyway, my review of the meeting is on my blog – you’re invited to visit. I could easily have not gone had I known you’d write such a thorough review! Looks like I’m going to end up as something like “the reviewer blog” !!! I had a nightmare last night and I am still shaking. I know there must be some deep and hidden meaning behind it and I am hoping that someone out there might be able to help me interpret this dream as Joseph helped the Pharaoh. I dreamt that I was the meat in the sandwich between Tzippi Livni and Sarah Palin, you know what I mean, that I as â€œLucky Pierreâ€. But, in this dream, upon my awakening in the morning, I had a terrible taste in my mouth and found myself between Golda Meir and Madeline Albright. Oy, gottenyu!! Didn’t you post this nightmare once already? Wish I could help but it’s too complex for me. I HAVEN’T YET FOUND THE HELP I NEED.